The State Commander is responsible for the overall day to day operation of the Louisiana Army Explorers and commands LAE headquarters and staff to assist him in commanding all subordinate units. 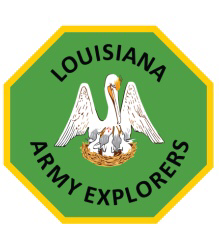 The State Deputy Commander is responsible to the Louisiana Army Explorers Board of Directors. is responsible for the management of day-to-day activities. The State Chief of Staff is the Senior Staff Officer under the State and Deputy Commanders. The Chief of Staff is third in command in the absence of the State and Deputy Commanders. The Primary duties of the Chief of Staff is to oversee the operations of all LAE Headquarters Staff. Commander and State Deputy Commander. The State CSM serves as a monitor and advocate for the cadre and cadet enlisted personnel. The State Command Sergeant Major is responsible to the Deputy Commander. The highest cadet enlisted rank in the Louisiana Army Explorers who is the cadet advisor to the State Commander, State Deputy Commander, State Chief Of Staff, and State Command Sergeant Major. The Cadet Command Sergeant Major reports directly to the State CSM.